Velobind strips of the Hot Knife type are the most popular. These strips are commonly referred to as GBC Velobind, Velobind Binding and Velobind Strips. 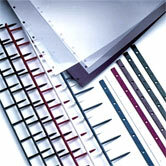 Over the years, many different machine models were made that use Hot Knife Velobind Strips. Some of the most popular are: The GBC System 3 Pro Velobind, Velobind System 2 , Velobind System One . Other models are Velobind 750A, Velobind model 323, Velobinder 123, Velobind 223, Velobind System 4 Bind. ADSS is a authorized distributer for Velobind and Velobind Machines. We are an authorized Velobind Repair facility as well.